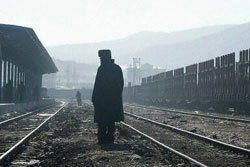 A Chinese guard on the Chinese-Russian border in Suifenhe, China (Photo: Frederic J. Brown/AFP-Getty Images). Russia’s latest census has produced a bombshell result: Over the past decade, the Chinese have emerged as the fastest-growing ethnic minority in Russia. While official data of the October 2002 census will be published only next month, preliminary figures leaked to the press show that Russia’s Chinese population has grown from just over 5,000 in the late 1980s to 3.26 million today. This makes the Chinese the fourth biggest ethnic group in this country after Russians (104.1 million), Tatars (7.2 million), and Ukrainians (5.1 million)—all indigenous inhabitants of Russia. More than three-fourths of Chinese immigrants have settled down in Siberia and the Far East. The census results lend chilling reality to Russia’s age-old nightmare of a Chinese takeover of the Asian part of Russia. Eighteen million Russians scattered across the India-size expanse of the Far East and Siberia face 250 million Chinese cramped across a common border in China’s northern provinces. In the past the huge Chinese demographic pressure was contained by a tightly sealed barbed-wire border, but when the Soviet Union collapsed, the 4,300-kilometer Russian-Chinese border was thrown open to bilateral trade. Chinese traders poured in to sell clothes and other necessities to Russians struggling with a deep economic crisis. They took back to China Russian timber, scrap metal, ginseng roots, frogs, and jellyfish. New glittering towns have sprung up in recent years on the Chinese side of the border, thanks to the booming cross-border trade, while Russian border regions have remained stagnant. Russia’s main Pacific port and naval base of Vladivostok, once closed to foreigners, today is bristling with Chinese markets, restaurants, and stores. The former mayor of Vladivostok, Viktor Cherepkov, estimates that Chinese businessmen control 30 to 40 percent of the economy in the Far East and 100 percent of its light industry. Russian officials concede that the region needs Chinese workers to compensate for a shrinking local population. “We face a bad shortage of manpower as Russians are leaving the Far East by the millions,” complains the presidential representative in the Far East, Konstantin Pulikovsky. The problem is not confined to the Far East. Russia’s population is declining at a rate of close to a million people a year and may shrink by 30 percent from today’s 145 million to 101.9 million by the end of 2050, according to the State Statistics Committee. The country needs millions of foreign workers from the former Soviet republics to keep the economy ticking. However, in no other part of Russia has there been such a massive influx of migrants from such a powerful neighbor. Experts predict that the Chinese community in Russia will swell at least to 10 million by 2010. Interestingly, Beijing’s main condition for supporting Moscow’s bid to join the World Trade Organization is to give Chinese labor free access to the Russian market. “The Chinese have used various ways to legalize their presence in Russia, including through mixed marriages, and gained economic footholds by acquiring considerable assets in a number of Russian regions,” said the head of Russia’s Federal Migration Service, Andrei Chernenko. The history of Chinese territorial claims to Russia feeds Russian fears of a demographic invasion. Former Chinese leaders Mao Zedong and Deng Xiaoping are both on record as saying that Russians had taken too much territory and that Vladivostok and Khabarovsk by right should be Chinese. Chinese tribes had settled in the Far East long before the Russians came there. However, the region was never part of the Chinese empire, and when Russia established its control over the Far East in the mid-19th century, it signed a treaty with the Chinese emperor asserting Russian sovereignty over the region. After two decades of “eternal friendship,” the two countries fought a short but bitter border battle in 1969, when Chinese troops occupied a Russian island on the Amur River and the Russians fired Grad multi-barrel missiles to wipe out the intruders. In 1997, Russia and China signed a border demarcation accord, which settled most of their border disputes except over three islands on the borderline rivers. As grueling negotiations over the disputed islands continue, the Chinese have been spotted trying to link their territory with the islands by dropping rocks into the river and sinking sand-filled barges in order to have more grounds for claiming the islands. Two years ago, Russia and China concluded a 20-year political treaty that declared the two countries “friends forever, enemies never.” The treaty stated for the first time that the two sides had no territorial claims to each other’s land. Russia is the only country with which China has such a treaty, and this is a reflection of its foreign policy doctrine, which calls for “relying on the North (Russia), stabilizing the West (India), and concentrating on the East (Taiwan) and the South (Spratly Islands).” Russia also needs China as a geostrategic partner and a vast market for Russian weapons, commodities, and manufactured goods. Yet Russians remain suspicious of China’s longer-term intentions. Chinese historians continue to denounce the current borders as unfair and imposed on China by Russia in the 19th century, and Chinese children are still being taught in school that Russia took away the Far East from China by force. Even though China, like India, is officially rated as Russia’s “strategic partner,” it does not have unrestricted access to the top-of-the-line Russian weapons that India has. While a Chinese military threat to Russia appears remote, Chinese demographic expansion is seen as a real danger. Russia has canceled visa-free travel for Chinese traders that was introduced to encourage border trade after the breakup of the Soviet Union and has imposed new restrictions on the Chinese trying to settle permanently in Russia. The Khabarovsk Territory governor, Viktor Ishayev, has banned granting citizenship to Chinese men who marry Russian women, even though foreigners have this option under federal legislation, while authorities in Russia’s easternmost Sakhalin Island have restored the Soviet-era border checkpoints to prevent illegal Chinese migrants from getting to the island from mainland Russia. However, these measures are ineffective, and demographers predict that the Chinese may become the dominant ethnic group in the region 20 to 30 years from now. The thoughtless shock reforms of the past decade have hit the Far East worse than the rest of Russia and have all but cut it off from the industrial centers of European Russia. Only 10 percent of the region’s economic ties today are with other Russian regions, as sky-high rail and air tariffs have forced Russia’s eastern provinces to turn to China, Korea, and Japan for supplies. While elsewhere Russians drive left-hand-drive cars, in Vladivostok, Khabarovsk, and Irkutsk they have long switched to right-hand-drive Japanese cars. There are indications that the federal government is finally awakening to the problem. It has drawn up a program of economic reconstruction of the region to be driven by the development of rich energy and mineral resources and the building of a rail transport corridor from Eastern Asia to Europe. The government is also trying hard to attract Japanese, American, and other foreign capital to the region. During a visit to the Far East last year, Russian President Vladimir Putin urged local authorities to do more to revive the economy. “If people here do not regenerate their region and economy, they will all be speaking Chinese or some other Asian language,” Putin warned.